Jason Schwartzman was born . . .
Jason Schwartzman? 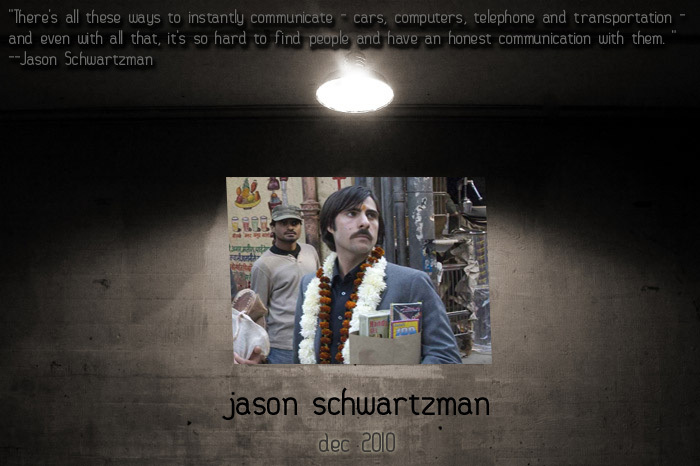 Who the heck is Jason Schwartzman? It’s a question that most people are still likely to ask when the name is mentioned, even though Jason Schwartzman made his screen debut twelve years ago, playing a major role in a film that garnered quite a bit of critical acclaim. He also stems from a family rich in Hollywood history, and is currently the star of a series on HBO. He was born Jason Francisco Schwartzman on June 26, 1980. His father, the late Jack Schwartzman, was a film producer who successfully brought Sean Connery back to his signature role of James Bond for a final time in 1983’s Never Say Never Again. His mother is Talia Shire – yes, the same Talia Shire who played Adrian, the shy, bespectacled girlfriend, and ultimately the wife, of Rocky Balboa in all those Sylvester Stallone epics. Shire, as most film buffs know, hails from the House of Coppola, as in Francis Ford Coppola, her brother, director of The Godfather trilogy, as well as Apocalypse Now! Francis Ford Coppola is Jason Schwartzman’s uncle, and Sofia Coppola and Nicolas Cage are his cousins. His reaction to feeling different was to make people laugh. Those feelings probably came in handy when Schwartzman decided to audition for the role of the obnoxious, beret-wearing misfit, Max Fischer, in Wes Anderson’s 1998 indie hit, Rushmore, named after the school at which Fischer is a hyperactive nerd whose failing grades do not prevent him from being a leader of men. It turned out to be a cooler story than even he had anticipated. Despite having no previous acting experience, Schwartzman won the part over dozens of competitors by showing up at the audition wearing a fake Rushmore patch. Such creativity served him well when acting opposite the great Bill Murray, who, in the film, is a patron of the school with eyes for a teacher played by the lovely Olivia Williams. Schwartzman’s Max Fischer has eyes for her, too, and despite his youth, proves to be a wickedly scheming rival. After Rushmore, Schwartzman wasn’t exactly a star, but he found himself in demand for other roles, more often than not in comedies. He is, as one interviewer observed, “something of a loon,” always looking for a laugh, which sets him apart from Uncle Francis, whose few attempts at comedy fizzled, and mother Talia Shire who is often intense. In Simone, he was very much in the background as Al Pacino took center stage. “I almost play a mute,” he said. “I'm a reporter. I just stand in the back and take notes.” That proved most fortunate for Schwartzman when the picture, one of Pacino’s mercifully rare excursions into comedy, proved a disaster in all respects. At around this time, he decided to part ways with Phantom Planet. Eventually, he resumed his musical career, recording under the name of Coconut Records, whose debut album, Nighttiming, was released in 2007. In the meantime, the acting roles continued to come his way. He was cast alongside Steve Martin and Claire Danes in the dreadful 2005 screen adaptation of Martin’s novel, Shopgirl. For what it’s worth, he held his own with Lili Tomlin and Dustin Hoffman in the oddball I Heart Huckabees. He also appeared as Louis XVI in Marie Antoinette, a film directed by his cousin, Sofia Coppola. His oddest appearance to date may have been as Beatle Ringo Starr in Walk Hard: The Dewey Cox Story, a comedy in which John C. Reilly played a fictional rock hero. And that is Jason Schwartzman.